Petit fours don't usually impress me. I'm not sure if it is because the cake is so darn small, or if it's because the layers are too thin. Maybe it's a combination. 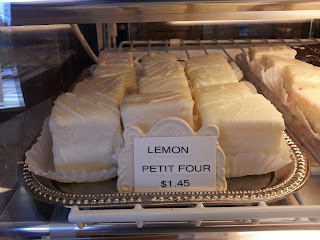 In any case, I found the biggest petit fours EVER at a new bakery in Cary, NC. These are obviously lemon petit fours and I could actually taste cake in them. I'm afraid to go back for another batch because I might be disappointed. Maybe they will be smaller with less cake next time. (Doubtful.) Lemon curd graced the middle of these cakes. I think I took a total of 4 bites instead of one bite with a standard petit four. The icing gave just the right amount of texture during the bite process. Ok...I'm tired of saying the name of this cake now. I'll write up a review of the bakery this week. I didn't get a full taste of their baked items during my visit, so more to come later!